How did you get started with the Law of Attraction? What do you struggle with when it comes to The Law of Attraction? Or other questions you’ve wondered about, check out this interview. Skye manifested over $3000 in less than a week. Someone basically “gave” her $1000+. It wasn’t always like this for Skye. Her former money story is Feast or Famine. In January she took a leap and joined The Enchanted Circle, even though she didn’t really have the money. Within less than a week she manifested over $3000. A little over $1000 of that was money someone gave her. (Listen for the full story). Skye’s focus since she completed the Script Your Millionaire Money Story workshop has been awareness. After forming a deep connection with her future self in the workshop, she is now able to check-in and see if she is thinking, believing, acting and owning the things her future self does. If she’s not, she shifts that. One example is when she threw out her ratty old belt because her future self would not wear something that was falling apart. She immediately took action and ordered another one. It sounds simple, but almost everyone’s future self acts with efficiency. When your future self realizes something is out of alignment, she/he takes immediate action. Tune in next time to hear Skye’s “ah-has” from the Script Your Happy Ever After workshop! Nicky is a digital marketer. Her business was up by 50% in January (at the time this interview was recorded). Life is awesome and nothing can throw her now. It wasn’t always like this. Nicky was a hustler. She didn’t talk about sleeping unless it was to say she wasn’t getting any. Her former money story was Rise and Grind. She glorified the hustle and took on every single project someone asked her to because she believed she had to get all the dollars while they were available. In three months, Nicky has connected with and stepped into her Future Self in a big way. Her new money story is Abundance and Worthiness. Embodying true worthiness means Nicky now says, “no” to projects she doesn’t want to work on and quotes her rate without wavering. She’s learned to own and share all the good stuff she is creating in her life, including the additional money she is making. Listen to hear more about Nicky’s journey from Rise and Grind to Abundance and Worthiness. “Life is awesome!” Says Michele who works part-time, has a new apple watch, and takes many trips with friends. Her business is booming. Things are changing and improving daily. It certainly wasn’t always this way for Michele. A few years ago, Michele was working more than sixty hours a week. She is a network marketer and had been to many trainings that amped her up, got her excited to build her dream life, but when she came home nothing changed. Michele was one of the first to take the scripting workshop, in 2015. During that weekend Michele had some surprising realizations about her life and what she wanted. She left tapped into the vision of the life she wanted and her future self. 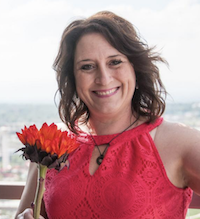 Since then, Michele has a new business, her traditional business has transformed, is newly single, lives in her dream home, owns her car and has money flowing in. One of the best parts is Michele went from working 60 hours a week to 16 and is doing fine financially. She is working less and making more. Michele has always struggled with making investments in herself. She recently committed to joining the Enchanted Circle. Money showed up the day after Michele said yes - a prepayment, a new credit line, a new coaching client worth $1750 just showed up. Every single time Michele does invest in herself money shows up for her. Michele now knows she can manifest money by letting go of what she thinks she knows and trusting the process. Her advice for you would be to stay to be open to possibilities. Michele is going to be taking the Write Your Million Dollar Story and is excited at what will come from this next scripting workshop. Stay tuned! Michele is a successful Mompreneur in the field of organic health. She helps women lose weight, gain confidence and work from home. Go to bulafitrocks.com to connect with Michele.